Gamma-ray and X-ray detectors such as PET, well logging, and high energy physics applications. Stopping power Dense and high absorption coefficient for gamma-ray. Uniformities Excellent energy resolution and uniform light output. Radiation hardness Almost no degradation in scintillation properties at 10*6 gray. BGO, (Bismuth germinate Bi4Ge3O12) is the crystalline form of an inorganic oxide with cubic eulytine structure, colorless, transparent, and insoluble in water. When it is exposed to radiation of high energy particles or gamma-rays, x-rays, it emits a green fluorescent light with a peak wavelength of 480nm. With its elevated stopping power, high efficiency scintillation, first-rate energy resolution and non-hygroscopes, BGO is an excellent scintillation material and is ideal for a wide range of applications in high energy physics, nuclear physics, space physics, nuclear medicine, geological prospecting and other industries. 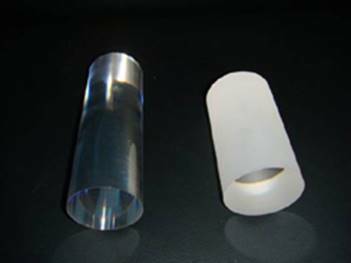 LYSO crystal is an ideal generation scintillator crystal. LYSO (Cerium-doped Lutetium Yttrium Orthosilicate.) LYSO crystal has the advantages of high light output and density, quick decay time, excellent energy resolution and low cost. These properties make LYSO an ideal candidate for a range of ray detection applications in nuclear physics and nuclear medicine, which require higher, improved timing resolution and superior energy revolution. We can provide LYSO in any volumes required and can supply finished pixel or pre-assembled customer-specific arrays or module configurations.